The Scarlet Macaw is an important indicator species for the health of the rainforest. The current population is estimated to be about 200 birds, which is not a good number. The macaws in our country are genetically distinct and geographically separated from other populations in South America. Despite the destruction of some of its habitat due to the hydroelectric dams that were built in their breeding grounds, they continue to exist. This is due in part to the efforts of Friends for Conservation and Development (FCD) and Scarlet Six Biomonitoring Team (S6). Recently, the Belize Wildlife & Referral Clinic (BWRC) also joined forces offering veterinary services in the field. Thanks to all this, along with countless volunteers, some new chicks are fledging safely. But, recently the monitoring team returned with sad news that two macaw nests had been poached due to their remote locations. The plight of the Scarlet Macaws should serve as a giant red flag to all Belizeans as it indicates that the future of our rainforest is in trouble. Indeed, the Chiquibul Forest is under siege by poachers taking hardwoods, Xate palms, Scarlet Macaws, wildlife, and anything else they can possibly take to sell. There are farmers planting milpas and people basically acting as if the forest belongs to them. Recently, a team crossed the Maya Mountain Divide from the Cockscomb Basin across and into the Chiquibul Forest. They were searching for Scarlet Macaws in order to understand more about their habitat and feeding grounds. On the Cockscomb side of the Divide, the hardy explorers found untouched, pristine areas. One magical place had dozens of Violet Sabrewings; another had hundreds of Morphos, White, Brown and Blue. It was a treacherous and difficult climb to get to the top and excitement built as they anticipated entering the Raspaculo Branch of the Macal River, known macaw nesting areas. But excitement turned to dismay as they traveled toward the “Raspa.” Sign after sign of incursion: trash and campsites. The poachers have made the Chiquibul their playground. Belize has already been invaded. A quick look at the border on Google Earth will show increased milpa clearing in our “protected areas.” Unfortunately, it is very difficult to monitor and control this invasion. Groups like FCD and Scarlet Six have spent their time taking turns monitoring known nests. It seems that simply the presence of people is a deterrent for poaching. Volunteers are welcome to camp and help protect the Scarlet Macaws, which means they are helping to protect the Chiquibul Forest Reserve. Start planning now to go next year, April through August, so you can help protect the nesting Scarlet Macaws, just by being there. FCD, together with the Forest Department, have been co-managing the Chiquibul National Park and documenting illegal activities since 2007. From the FCD website: “FCD’s goal has been an ongoing struggle to reclaim the integrity of the Chiquibul National Park. Led by Rafael Manzanero, these guys have been fighting the good fight for years and for the most part they are making little progress, but they need our help. The ultimate goal is to gain World Heritage status for the Chiquibul Cave System and Nohoch Ch’en (Holec) and Puente Natural. The Government of Belize has assigned squads of Belize Defense Force (BDF) soldiers permanently along the Chiquibul border. Funding is needed for high tech drones, tracking devices and cameras. With these tools and with the help of the BDF along the border, the tide can be stemmed. You can help by donating time or money, equipment or supplies. Roni Martinez, S6’s Director of Field Operations says: “More rangers are needed to cover the large area and further population management strategies for next season”. Funding campaigns for future efforts will be announced soon. Scarlet Six and FCD are two separate entities working together for the mutual goal of maintaining a healthy and productive Chiquibul ecosystem. Both entities need your help. You can also consider a donation to the Belize Wildlife & Referral Clinic, which provides free health checks in the field for the wildlife. 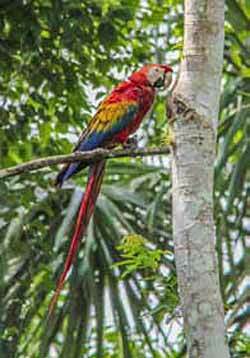 Please think about how you can help save the Chiquibul and the Scarlet Macaws. We must not let the Chiquibul National Forest, the largest protected area in Belize, be destroyed or stolen. This is Our Jewel. It is ours to lose. In the last column, warnings were issued to all Belizeans about the dire situation in the Chiquibul Forest Reserve, the incursion and theft of natural resources and the woeful lack of personnel and equipment to deal with the problem. In September 2014, a tourism policeman was murdered at Caracol in the middle of the day, witnessed by horrified tourists, tour guides, and a fellow officer. The police had confiscated horses the previous day from illegal loggers who returned to issue their revenge on the unsuspecting young Danny Conorquie, who gave his life in the battle for sovereignty of this great nation, Belize. Because of a continued lack of security efforts along the border by the Government of Belize for many years, the Guatemalans were emboldened to cross into Belize. It was just a matter of time before they would retaliate for Belizean authorities doing their job and disrupting their illegal activities. Unfortunately the victim was a 20-year-old Belizean who became the lightning rod of their anger and didn’t have a chance, being ambushed from behind in a tranquil plaza at Caracol, shot in the back and then executed by shots to his head. Because of the sequence of events, it is presumed that these were illegal Guatemalan loggers who tend to be some of the most dangerous of the “invaders” crossing into Belize. As we have seen in Belize, Peru, Brazil, Indonesia and in other midlatitude countries, the illegal lumber cut and sold is prime old growth cedar, mahogany and rare sought-after hardwoods, which many times end up being shipped to North America to satisfy those high-priced markets. It is important to note that the Caracol National Monument and Park is surrounded by, but not under the jurisdiction of, the Chiquibul National Park and therefore is not patrolled by Friends for Conservation Development (FCD). The National Institute of Culture and History (NICH) is the trustee of this area and is in charge of patrolling using the Belize Defense Force (BDF). The tourism police tasked to Caracol are trained by the national police as special constables to protect and keep order at these remote ruins, which, until September, was a relatively safe assignment with only minor incidents of theft by Xateros from Guatemala. Ministers and other officials recently visited the Chiquibul and discovered the stories were, indeed, true; they realized the gravity and importance of the situation and resolved to implement change. The first issue to be addressed was the size of the patrol force. FCD has had men patrolling the area, but there is too much ground to cover by too few men, now known as the “Magnificent Seven”. Other measures identified are the need for better communications and transportation. Money is needed to better equip and pay for the rangers who live away from their families for days, sometimes weeks at a time while on patrol. Rafael Manzanero, FCD, and others organized a Saturday telethon on October 18th, and an astounding BZ$320,000 were raised that day. Political concerns were filed away for another day and people came together as a nation to support this important cause. The support and money are a huge boost and will help in the goal of FCD to fund up to 24 rangers who will rotate in and out of the reserve. In addition, more BDF soldiers will patrol the area with FCD rangers. It is anticipated that the additional forces will minimize the incursion onto our beloved soil. Still there is a need for permanent sustainable protection. If the Chiquibul National Park were to be designated a World Heritage Site, world-wide attention would result in additional funding opportunities for the future. Experts from around the world are already discussing and planning ways to make this area accessible to the few intrepid ecoadventurers willing to forgo luxury in exchange for adventure and a rugged, but satisfying experience.